To continue the story of our recent short holiday in Wilderness this is a photograph of The Tops Guesthouse where we stayed and which we used as a base. It is located on the hillside above the village of Wilderness and has magnificent views over the village to the beach and the sea beyond. This was our second stay and we can highly recommend it. The rooms are attractively furnished and comfortable, the view is amazing and it is literally 5 to 10 minutes walk from the centre of the village. 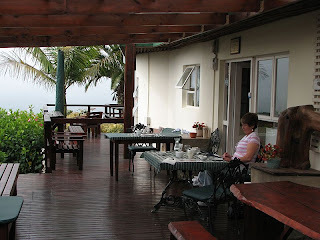 The photograph shows Carol sketching the view from our breakfast table on the deck. Our room opened onto this same deck near the tree in the background. Beyond the tree are the beach and the sea, not really visible in this picture, which was taken on a misty morning. The day after we arrived we took a leisurely drive from Wilderness to Knysna. Knysna is a very picturesque town stretching around an magnificent lagoon, which opens to the Indian Ocean. It is a water sports paradise very popular with yachtsmen, water skiers, fishermen and boating enthusiasts of all descriptions. But it is much more that that. It is a very attractive holiday destination with a lot to see and do. A fairly recent attraction is a waterfront development partly modelled on the much larger and very popular Cape Town Waterfront. 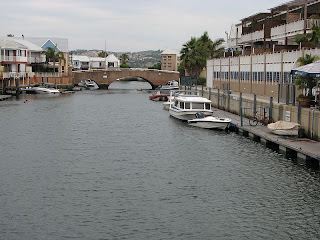 The Knysna Waterfront offers a mix of shops, restaurants, boat trips, entertainment and an upmarket residential area with direct access to the lagoon via a series of canals. The picture below was taken from the commercial part of the waterfront looking toward the residential section. By chance we noted that there was going to be a demonstration of motorcycle stunt riding at the waterfront and decided to hang around for an hour or so to see it. I was a keen motorcyclist for most of my life and have only recently sold my last machine. The story of this demonstration will be the subject of a separate post but to say the least, I was blown away by the skill of the three riders who entertained a very enthusiastic audience. Sounds like you had a wonderful time at the Wilderness. Lucky you. I read your review about the restaurant you went to - couldn't get over the price of the meal for four. Things have really gone up in price in SA. I suppose people earn a lot more these days to be able to afford to eat out. Thank you. We had a wonderful holiday in Wilderness. Prices have gone up a fair bit in the past few years but that restaurant is a rather upmarket establishment and was chosen to celebrate a special family anniversary. There are a many more affordable places to eat out on a more ordinary occassion.